Charlotte Burch and Peter Wilson at the Congregational Church of New Canaan's YG Mission Trip return home on Sunday, Feb 24, 2013. Photo by Jeanna Petersen Shepard. Griffin White couldn't remember where the phrase el milagro continua -- the miracle continues -- came from, but he remembered that it has been a part of Congregational Church of New Canaan's Youth Group for years. He felt that this year's mission trip especially lived up to it. 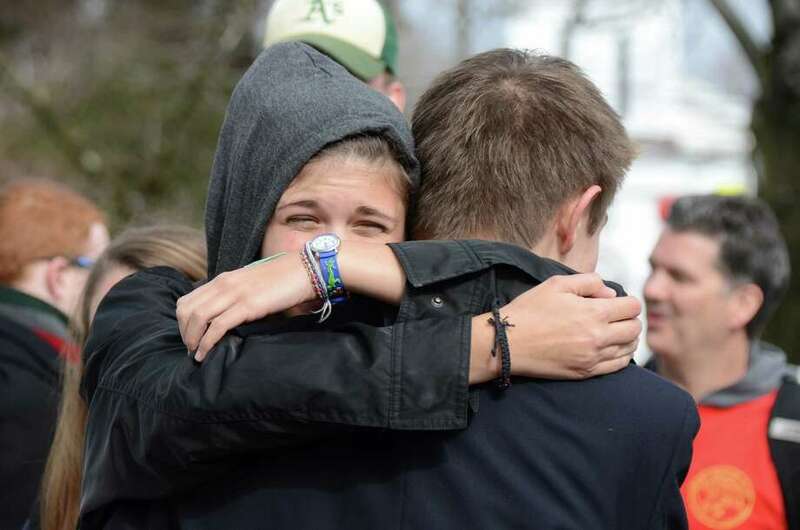 "This year we really saw that the miracle was in action and you were really changing all these people's lives," White, a senior at New Canaan High School, said. On Feb. 15, 183 Youth Group members and adult supervisors boarded a plane bound for 10 days of service work in the unincorporated island territory of the United States, Puerto Rico. Its western shores are about 75 miles east of Punta Cana, Dominican Republic, and its eastern shores are 40 miles from the British Virgin Islands. Within this island paradise exists a barely functioning economic system. According to the latest data from the World Bank, Puerto Rico's Gross Domestic Product growth rate has hovered around negative 2 percent for the past four years. Unemployment is estimated to be 16 percent, according to the CIA World Factbook. The percentage of the population living in poverty was 41 percent in 2010, according to the Government Development Bank of Puerto Rico. Into this situation entered 148 "mission fish," as they call themselves, high school students on a religious service mission organized as a part of the Youth Group of the Congregational Church of New Canaan and 35 advisers, alumni, contractors and logistical staff. The mission was to help renovate and repair Hogar Posada la Victoria, a women's drug and alcohol rehabilitation facility in the inland district of Toa Alta, on the outskirts of the urban sprawl of San Juan run by a woman named Gladys Vazquez, herself a recovering addict. "The woman that ran the center owned the property but had little resources to do work on the structures," said Kim Case, the administrative assistant for Senior Minister the Rev. Harold E. "Skip" Masback, and a team leader for the Youth Group. "Another team worked on the dorms, the chapel, the kitchen, the roof; they built a gazebo and a baptismal font and did a lot of general outside maintenance and repairs." A normal day for the group began at 7 a.m. with a quick breakfast and a devotional prayer, then heading to the work site. Eight of the 11 teams of about 10 kids each worked on the campus itself, and three worked on surrounding houses. They didn't work alone. "People who were attending the rehab center actually worked alongside us," said Kerinne O'Connor, an NCHS senior. "They'd grab a paint brush, and through broken Spanish and broken English we'd try to communicate with each other and it was a really beautiful thing to see how small a language barrier could be." Around 5 p.m. the teams would return to their base, La Casona, a church with a large property containing dorms and common spaces used by many as a religious retreat. At night, after dinner and some recreational activities, the teens spent the hour or two before bed in a vesper session with their team. "The vesper has been a youth group tradition ever since it started," White said. "You sit down in a dark room with a candle and your team and there's a topic. One topic was `agape,' which is unconditional love. Anyone can talk about their experience with unconditional love. It's a time to reflect on the day and become close with your team." Several in the mission group said the trip was a deeply moving experience. "This year I really felt transformed," White said. "We worked with this lady Gladys, one of the most amazing people I've ever met. She taught me how to be more understanding about the things in life you don't understand. These ladies went through so much beating and abuse, but they kept fighting and God was there to help them." Alex Brannan, another NCHS senior, added, "I found a lot of times we're going through life quickly and we don't have time to live in the moment. Spiritually, I can't find God when I'm just constantly doing everything. I can find God through peace and through service and less judgment and more acceptance, we can help make the world a better place." Such reactions are exactly what the leaders of the Youth Group have in mind when they organize these annual trips. "I think we do mission work for a lot of different reasons but a main one is to get them out of New Canaan and see another faith community and other ways of living," said Caroline Ainsworth, director of youth ministries at the Congregational Church. "It gave kids a chance to put it all in perspective, to make them see that they are a part of something larger than themselves. I hope they learned about the world and their place in it." Being such a massive group could have its challenges, but also its benefits. "You kind of really quickly get to know people," Brannan said. "It's a really surreal experience in a lot of ways. You're surrounded by things you're not in general society, like love and acceptance. You even bond with the surrounding community. You get to know them and share your stories and they share their stories which were very powerful." The Youth Group runs for all four years of high school, and many members join after similar Congregational Church groups in middle school. It meets every Sunday night for activities and discussion. "The 11 team leaders are working with the kids all year, so at this point we have developed a deep relationship, so we're not barking at them the whole time. We also lift up seniors as senior leaders and they take some responsibility and they want to have the best trip," Case said. Seniors made up a large percentage of Youth Group members this year. That fact may have led to a trip that was focused and well-led. "In our final worship together, all the seniors gave a short little blurb about the trip and almost every person mentioned the word family," O'Connor said. "It's really incredible to build these bonds with people I wouldn't know if not for Youth Group."